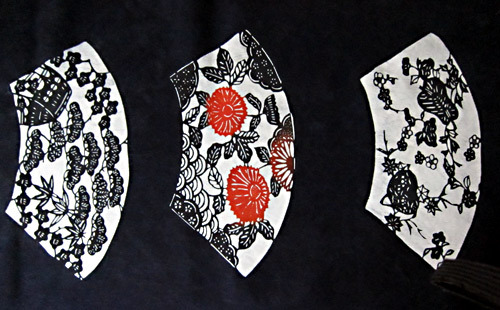 Katazome is a traditional Japanese stencil technique for dying fabric and paper. 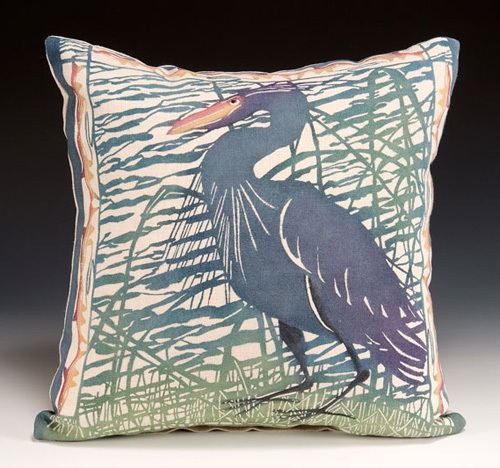 A rice paste is pushed through the open areas of a stencil, thus creating a resist during the later painting or dying process with fabric. 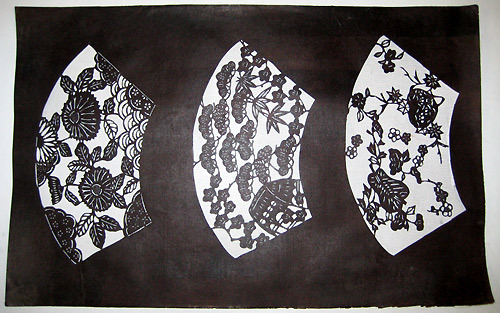 In case of dying paper, ink is painted through the stencil's open areas directly. 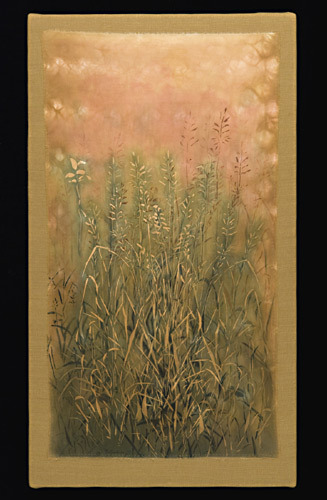 The following report is based on my experience with this technique during a class at the studio of John Marshall in Covelo, USA, in the Summer of 2010. 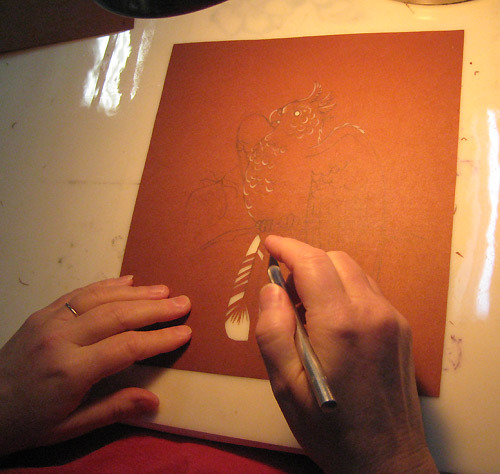 In earlier days, stencils were made from two layers of water-proof mulberry-paper. Silk threads or hairs were glued between these layers for stabilizing the stencil and adding further details in open areas of the stencil. Today also single paper layers are cut and stabilazed with silk gauze. 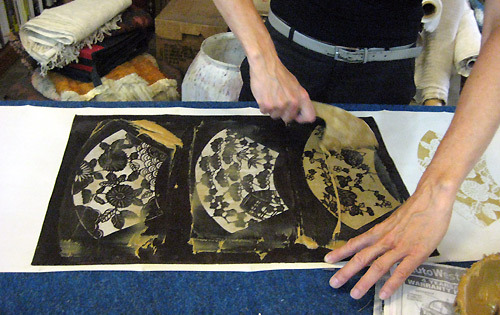 Preparing the resist paste: rice brane, komon nuka, and rice flour are mixed with water and formed into balls. After a night in the fridge, the balls are steamed and then with a mortal stirred to a homogenious paste. 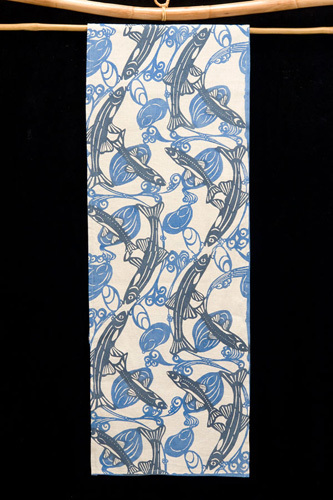 The paste is applied to the fabric with a wooden spatula. 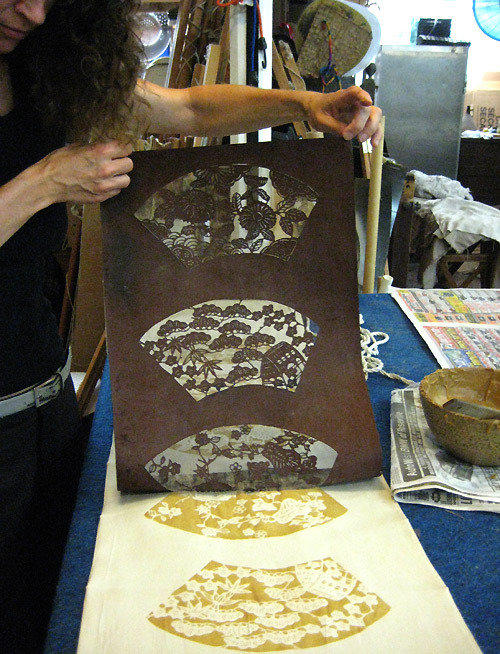 The rice paste is printed onto the fabric and has to dry now. 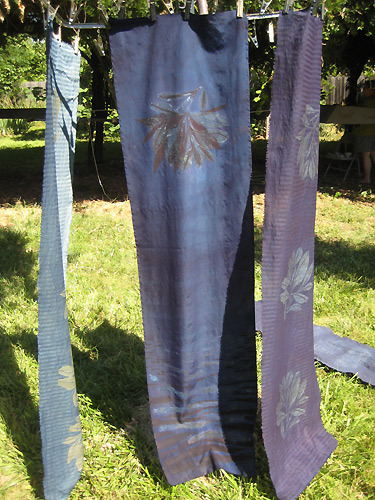 Dyes can be prepared by mixing pigments with soy milk. 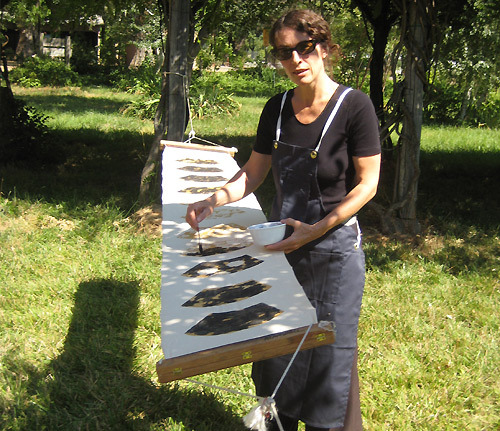 Soy milk is also used for sizing the fabric before painting on it. 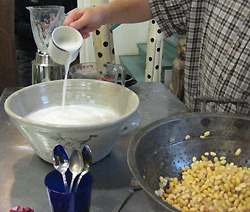 Soy milk is prepared from soaked beens with the help of a blender. 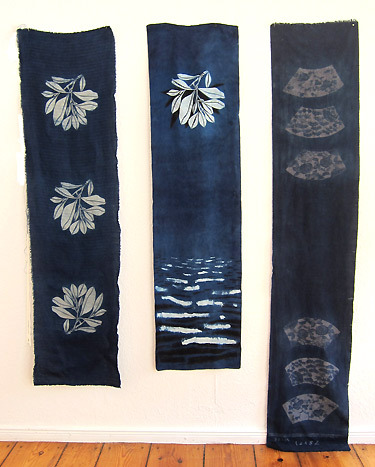 For working on the prepared fabric, it is hung between wooden bars, harite, and stretched with shinshi, needles from bamboo. 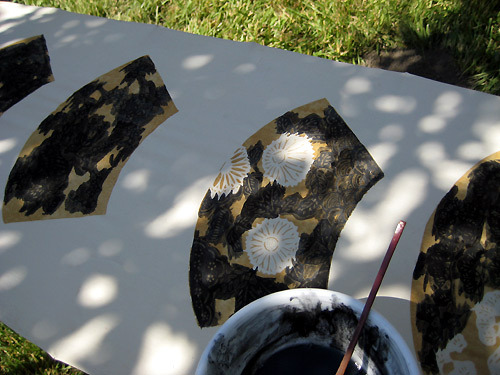 Paste can also be applied directly with a paper cone or painted with a brush, which is called tsutsugaki. 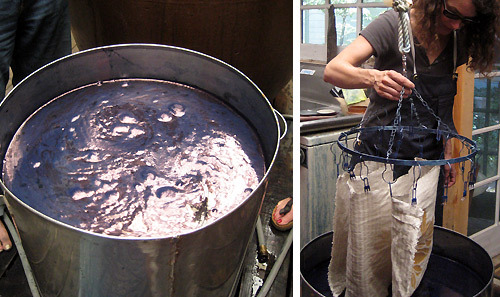 Here the prepared fabric is dyed in an indigo vat. Repeating the dying deepens the colour. 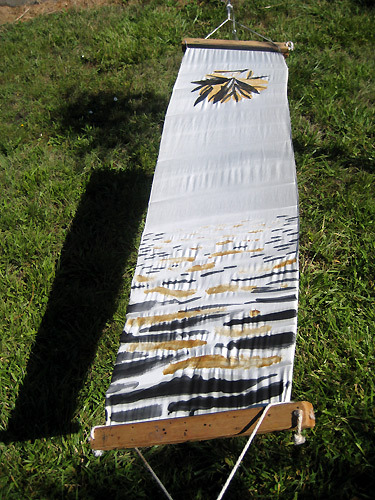 After painting or dying, the fabric is sized with soy milk and the paste removed.